On October 28, 2009, Federal Bureau of Investigation K-9 Freddy lost his life in the line of duty. Freddy will be returned home to Quantico, Virginia. A memorial will be held at Quantico and Freddy's name will be added to a memorial wall. Like most dogs, he served loyally, alongside federal agents in the line of duty -- and in a violent shootout earlier this week with alleged terror suspects, he took a bullet for the team. An FBI K-9 named Freddy, a three-year-old Belgian Malinois, was was killed Wednesday while federal agents raided the hideout of men suspected of involvement with an organized crime ring and who were also allegedly part of a radical Islamic sect. Luqman Ameen Adbullah, under investigation by the FBI's Joint Terrorism Task Force in Detroit, was killed in an exchange of gunfire after the FBI says he refused to surrender to agents executing an arrest warrant at a warehouse in Dearborn, Mich. It was during this exchange that Freddy was hit by a bullet. Following the raid, 10 suspects were arrested and charged with conspiracy and theft of interstate shipments, mail fraud to obtain the proceeds of arson, illegal possession and sale of firearms, and the altering an tamping of Vehicle Identification numbers. According to court documents and an FBI affidavit, Luqman Ameen Abdullah was the imam of a radical fundamentalist Sunni group Masid Al-Haqq, which seeks to establish a sovereign Islamic state inside the United States. 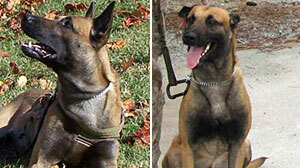 Freddy, born in February 2007, received law enforcement training at Quantico, Va. He joined the FBI in September 2008. In a statement, the FBI memorialized Freddy saying, "In the line of duty, Freddy gave his life for his team. He will be missed by his FBI family." The agency plans to hold a memorial service for Freddy at the Bureau's Quantico facility. Cards and memorials for Freddy's team members can be sent to 'Freddy's Team,' care of the FBI -- 477 Michigan Avenue, 26th Floor, Detroit, Michigan 48226. Donations to a K-9 Law Enforcement Memorial in the memory of Freddy can be sent to the FBI Agents Association, Attn: K9 Fund-Freddy,P.O. Box 12650, Arlington, VA 22219.